$11,731Why are Our Prices So Low? Need Sooner or Have Questions? GemsNY is the online extension of our 25+ year old wholesale gemstones business, specializing in selling precious gemstones to retail jewelers around the world. GemsNY.com enables us to reach end-customers without the costly overhead or middlemen mark-ups of traditional retailers, allowing US to sell to YOU while maintaining our wholesale prices, which are 60-70% lower than those of retail jewelers. All of our gems are 100% natural - we do not carry lab created or synthetic gemstones. Please note, recipient is responsible for all customs duties, taxes and fees associated with an international shipment. We offer a very simple and straightforward 30-day money-back return policy on your purchases. We also offer one Free Domestic Return Shipping label within a 6 month period (only applicable for returns). Please call us for your complimentary FedEx label at (888) 436-7692.
International customers will need to return items at their expense. Orders with multiple gemstones or comparison shopping orders will need to return items at their expense if all the gemstones within the order are returned. Custom Jewelry items (Note: Items from our Make Your Own jewelry can be returned for a refund). Jewelry orders with personally engraved message. Gemstones with personalized laser inscriptions. Loose gemstone purchases that have been set into jewelry by a third-party jeweler. 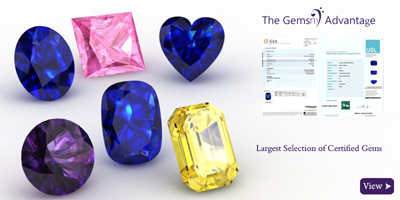 We will certify the Gem with GIA using expedited service for charge (2-4 days, subject to availability). Please note this charge is not refundable in case of a return. All of our gemstones more than $5,000 in price can be laser inscribed with a unique ID number on the girdle of the gemstone. The unique identifier can be inspected under 30x to 50x magnification to verify your gemstone has not been switched by a local jeweler. Please select "Yes" from the Laser Inscription drop down menu, if you would like to have the gem laser inscribed (adds 2 business days). The retail value for this item is based on the appraised value provided by world renowned, independent lab Universal Gemological Laboratory headquartered in New York City Diamond District. This item is 67% off of a general retail store price! Imagine paying 3-4 times the price for this same item at a jewelry store! GemsNY provides a detailed independent certificate report and appraisal from an independent lab Universal Gemological Laboratory (UGL) headquartered in New York City Diamond District. This complementary $150 comprehensive gemological report is provided free of charge with this purchase! GemsNY would like to prove to you that we really are 50 to 75% cheaper than a traditional jewelry store. This is why we have provided to you a detailed independent appraisal from world renowned, independent lab Universal Gemological Laboratory (UGL) headquartered in New York City Diamond District. This complementary $100 comprehensive gemological report is provided to you free of charge with this purchase! GemsNY will ship domestic orders via FedEx scheduled to arrive before Valentine's Day. Please note, GemsNY is not responsible for delays encountered by FedEx, which may result in your package being delivered after Valentine's Day. International shipments will NOT arrive for Valentine's Day.